Reiki - Karsa Spa. Are you ready for a REAL massage?! Reiki is an energy technique that reduces stress, promotes a sense of deep relaxation, and encourages healing on many levels. Reiki is a safe energy work that helps you balance and harmonise body, mind, emotions and spirit. Reiki involves the transfer of divine source energy through the practitioner to the client, enhancing the body's natural ability to heal itself. is encouraged! All our Reiki practitioners are trained in Reiki Tummo techniques. feet. 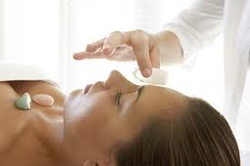 Reiki usually begins from your head and works in a downwards direction, cleaning any negative or blocked energy. We begin with the front , then back of your body, followed by focused Reiki on your specific problem area to encourage healing at many levels. chakras with Reiki and crystals, releasing blockage and negativity. Finally we balance your key chakra centres in relation to their corresponding chakras.